Awana is a Bible-based program where children gather to study and memorize scripture, play games, participate in devotions and earn awards. Awana stands for Approved Workmen Are Not Ashamed and teaches kids the value of hiding God’s Word in their hearts and sharing the gospel with others. Awana meets Wednesday evenings from 6:00-7:30 pm. Two-year-olds through four-year-olds meet on the Preschool Hall and 5K-5th grades meet in the Fellowship Center. Registration sheets and schedules are attached. You can learn more about Awana at www.awana.org. Sunday School is a time when children can gather to hear and learn more about the gospel of Christ. The preschool department includes a nursery for babies, birth-23 months, which is located downstairs next to the Connector. Two-year-olds through five-year-olds are located on the Preschool Hall. Each age has their own classroom with age appropriate, Bible-based curriculum. First through fifth graders meet in The Hangout upstairs in the children’s area. We begin with praise and worship music, prayer requests, praise reports and a whole group Bible lesson. The children then break into small groups to further “dig” into the lesson. Small groups are divided by age and gender. All Sunday School classes begin at 9:40 and dismiss at 10:45. FLYTE 6 is a Sunday School class designed specifically for 6th graders. Each week, boys and girls have a fellowship time where they enjoy snacks before the lesson begins. Topics are biblically based and address issues that preteens face daily. This is a great class to prepare 6th graders to transition to the youth group as a 7th grader. FLYTE 6 meets @ 9:40 in Room 206. Our 6th graders meet in SOAR on Sunday nights, 6:00-7:30, and Wednesday nights, 6:00-7:30. Our 6th graders get "sneak peeks" when they get to participate in designated events with the youth group. In August of each year, our 6th graders enjoy a retreat prior to Promotion Sunday. 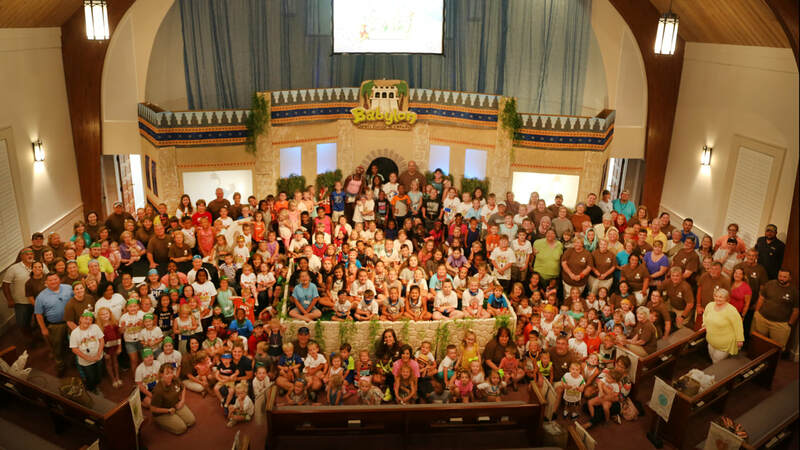 Children’s Church is offered for two- through five-year-olds during second worship service. Two-year-olds remain in their Sunday school class for an easier transition. However, parents of three through five-year-olds are asked to pick up your children after Sunday school to join the praise and worship music in the Sanctuary. They will then be dismissed to the front, right-hand side of the Sanctuary. Teachers will lead the children to the Preschool Hall for an age-appropriate, Bible-based lesson. Children will hear Bible stories, sing, make crafts, play games, and eat a small snack. Children’s Choir is a time for children to worship and praise through song. During this time, kids learn various scripture-based songs, play simple instruments and work on musical dramas. 1st-6th graders meet in the Sanctuary from 5:00-6:00 on Sunday evenings. Preschooler Choir meets on Sunday evenings on the Preschool Hallway 5:00-6:00.